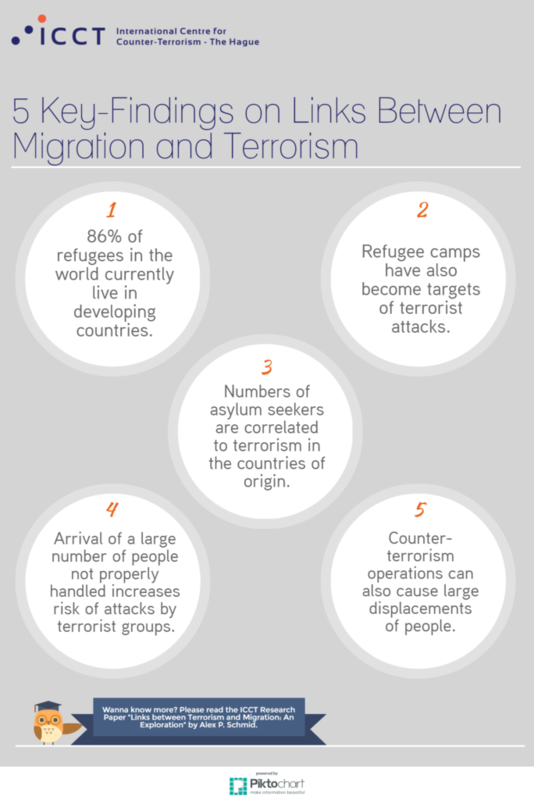 This Research Paper explores and questions some assumed causal links between terrorism on the one hand and (forced and irregular) migration on the other. The paper delves into the role that state and non-state terrorism might have in causing migration as well as analysing if and how refugees’ camps and the diaspora community might be a target for radicalisation. One of the findings of the paper is how migration control for the control of terrorism is a widely used instrument; however, it might hurt bona fide migrants and legal foreign residents more than mala fide terrorists. Finally, this Research Paper offers recommendations that can go some way towards disentangling the issues of (refugee) migration and terrorism. How to cite: Schmid, A.P. “Links between Terrorism and Migration: An Exploration” The International Centre for Counter-Terrorism – The Hague 7, no. 4 (2016).